'Mythbusters' Have Fun in the Name of Science Can yodeling cause an avalanche? Adam Savage and Jamie Hyneman of the show Mythbusters put legends like this to the test. They talk about their adventures, and how their differing styles of inquiry actually complement each other. Can yodeling really cause an avalanche? 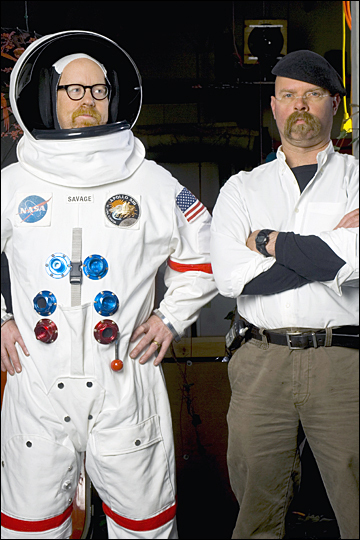 Hosts Adam Savage (left) and Jamie Hyneman take on wacky science challenges like this on their show, Mythbusters. Can a singer really break glass with just his or her voice? Rock singer and voice coach Jaime Vendera and Mythbusters co-host Adam Savage try their luck. Have you ever heard the claim that yodeling can cause an avalanche? Picture this: a lederhosen-clad vocalist on a mountainside belting out a call that sends ice and snow crashing down the slope. Adam Savage and Jamie Hyneman tried it. 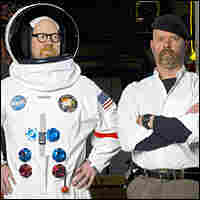 The duo are co-hosts of Mythbusters, a show on the Discovery Channel. In the name of science, they put sayings such as "a rolling stone gathers no moss" and other popular suppositions to the test. Savage and Hyneman talk to Andrea Seabrook about yodeling, avalanches and explosives, a heavy metal singer and shattering glass, and how their sometimes-clashing personalities actually make for a powerful problem-solving tool.